Each of the flower bridges are per 6ft table. Customised with your colour scheme and style. The image features the enchanted forest theme. The floral bridge is a part of our exclusive collection. Use to go up and over the tables – be it the head table or the VIP guest tables. 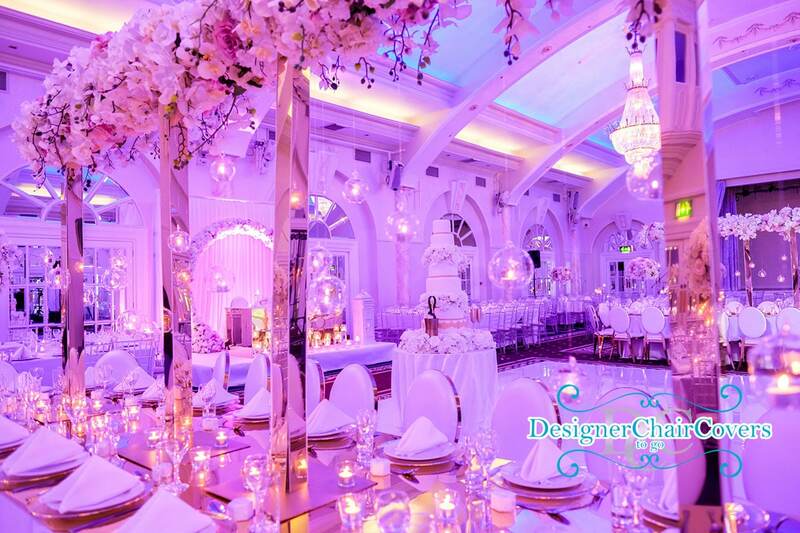 WE customise the florals to your design, enchanted forest, luxury orchids or candles! curved trumpet vase - gold centrepiece hire. Gorgeous silver plated chrome punch bowls for delicate floral arrangements. Perfect for the guest tables or top tables. The punch bowl is perfect for an arrangement of fresh or silk flowers. Or you can dry hire and collect from our warehouse today! The 7 arm Vintage candelabra is a new collection item, The glass shabby chic effect of the candelabra creates a warm welcoming table centre. Equipped with 7 arms its one of the largest we currently hold. A real talking point centrepiece Perfect for weddings that want to incorporate a vintage flare Subtly understated yet incredibly elegant Featured in the photograph with our gold chiavari chairs for the perfect Downton Abbey regal look! Mirrored centrepiece design- Low and pretty the perfect choice for the table for a candle choice. Candles and flowers on a combined booster box. Blossom Tree hire for weddings and events. 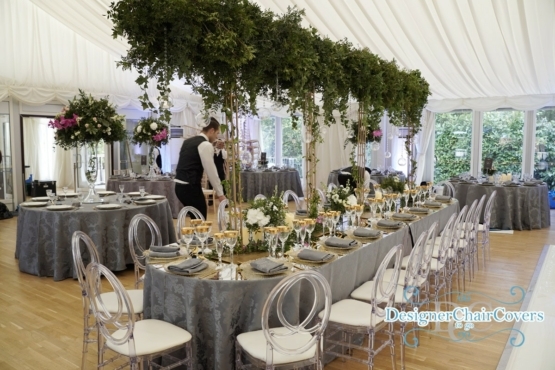 Hire our ivory blossom tree to make your event have that special feel whimsical dramatic feel. Available to hire today. Gold Punch bowl with beautiful silk florals - We can also provide the silk arrangements if you prefer. The price quoted is for a silk arrangement. Get in touch today for assistance. Crystal table chandelier - tall dramatic and pretty. If your a lover of crystal then let our crystal centrepiece stand out and wow your guests. 6 tiers of crystal make this the ultimate in centrepiece. 1M of beauty ideal for weddings and events. For this particular wedding we added feathers to make the dramatic centrepiece stand out even more. The Designer Globe from our Crystal Centrepiece Range is an elegant and simply stunning option for table centrepieces. 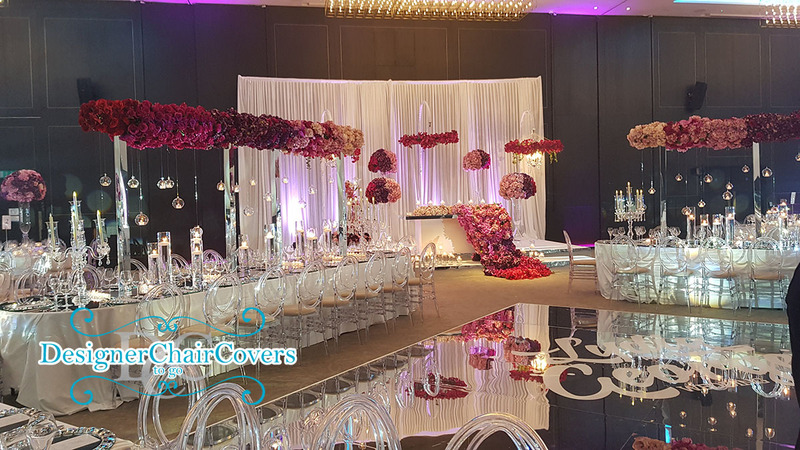 The crystal ball is ideal for the weddings or events that wish to have a crystal sparkle theme which boasts class and sophistication. With a large votive candle the centerpiece has a stunning glow on the table which really creates a beautiful atmosphere in the room. Simple Stunning and Beautiful. The Globes are availblie in two sizes. Medium and Large. The large has a 100cm stem with a large Globe and the Medium is 80cm Stem with a medium Globe. If your unsure of which size why not get both, its a brilliant way of mixing heights to create a dynamic look in the room, this look works exceptionally well for high ceiling venues. Creating an instant wow factor for guests when they enter the room. For more information get in contact today. The 70cm Martini vase alongside the silk white rose ball. Mix and match with a mix of our beautiful floral arrangements. Part of the Bronze range of centrepieces. The most popular type of candelabra due to its class elegance and beauty, the silver five arm candelabra is 80cm in height making it perfect for table conversations tall enough to have dramatic flowers draped and decorated which perfectly mixes the traditions of flowers with the modern idea of table candelabras. Our candelabras come with 5 non drip candles and a large mirror base which is perfect for reflecting light and completing the look on the table. Candelabras look great with or without flowers which we can arrange for you or get your florist to create a stunning piece. We also have 100cm Grand Candelabras available for hire. Mirror cube vases for hire with fresh or silk florals. A great little but pretty centrepiece or use for dressing your head table. A perfect centrepiece for those wanting an understated piece. White 80cm Candelabra for hire. Mix with a glass vase or another style of centrepiece. The candelabra stands at 80cm in height perfect for encouraging conversations by not blocking the way for your guests. Why not use the white candelabra on a banquet styled layout theme along the centre of the table for that ultra modern and chic styling. Hire alone or combine with our other items for the best possible pricing.